Oh how I love rainbows! Rainbows bring me to a time of happiness, hope and endless imagination! As a child, I remember jumping up and down with excitement and feeling so lucky when I would spot one in the sky. I wonder why I love rainbows so much? Could it be the bright colors? Or the hope it brings because in these parts, they are not very common? Perhaps it’s because it’s one thing that I could actually draw very well. I was not a very artistic child. (let’s face it- I am not a very artistic adult either). In fact, when it comes to helping the kiddos with their projects, I would rather help with the Math, Language, History, Science, anything other than Art. When I have to help with an artistic project, such as a leprechaun trap, there are lots of tears, and they’re usually all mine until Dad comes to everyone’s rescue! You see, my problem is my head; in my head, the picture is beautiful and great- but implementing my mind’s image lies the issue and I can’t settle for anything less than that pretty picture my mind created. But I digress… Rainbows, now I could draw a mean rainbow, still can in fact and I’m pretty darn proud of that! 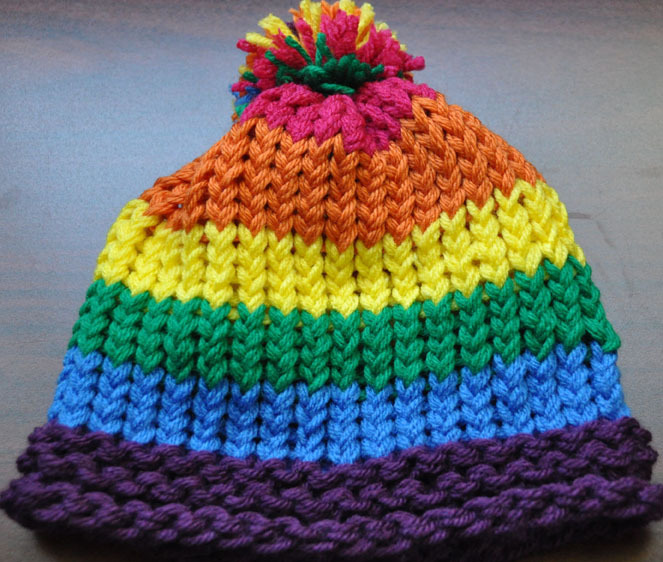 Well, I am not about to show you my beautifully, perfectly aligned rainbows, so here is a rainbow hat that speaks to my inner child’s pride. I still absolutely love rainbows and feel so artsy fartsy since it’s 1 thing that I have mastered! I hope that this rainbow hat sends hope and laughter, giggles and love, unicorns and all things possible to a young chemo warrior!